Regular readers of my blog will know that for the past few months I’ve been doing a bit of running. Nothing special, just a few miles three or four times a week. 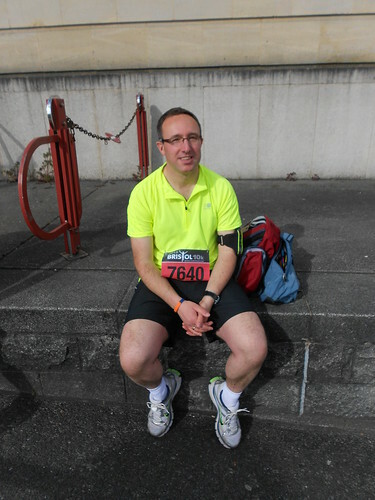 So the weekend just gone marked something of a watershed moment – my first proper race! 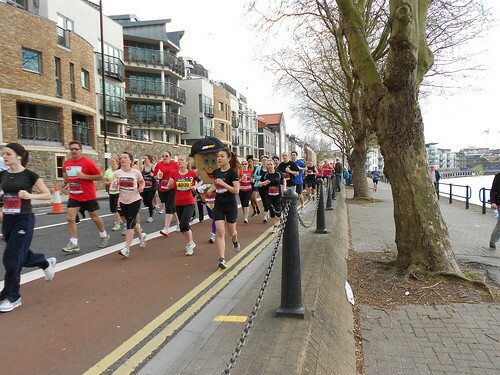 Yes, it was the long-awaited Bristol 10k. No hills. No muddy scrambles. And no having to stop to wait for the dog to finish rolling in something disgusting. Just six and a quarter miles of flat, traffic-free roads. My support team seemed to be zipping around the course about as quickly as I was, as she managed to catch me on camera on a number of occasions. She also seemed a little stunned that I wasn’t right at the back (as, to be honest, was I), but managed to wave and make encouraging noises. Though she did say afterwards that I didn’t look as knackered as I should have done, so clearly wasn’t running fast enough. Nice. As you can see from the photo above, I finished the race and got my medal. I even managed a bit of a sprint down the home straight. And having covered the course in 56 minutes and 9 seconds, I was pleased with my time. (Although it sounds a little less impressive when I point out that came 4,375th!). But I enjoyed myself, I finished in under an hour, and I didn’t get overtaken by a single piece of fruit. * A rather unimpressed Natalie, who had been planning on a lie-in until I realised that the first train into town was too late to get me to the start on time and that I’d need a lift. 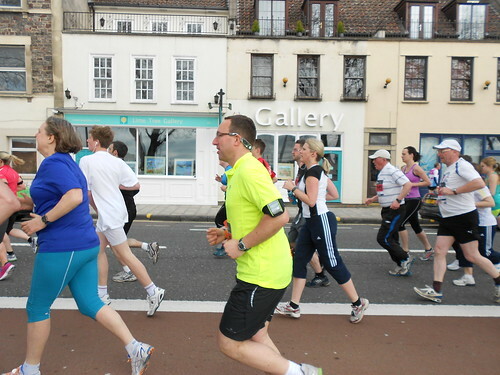 Typical comment from my support team: “Oh, I didn’t realise you were running in fancy dress.” I wasn’t. 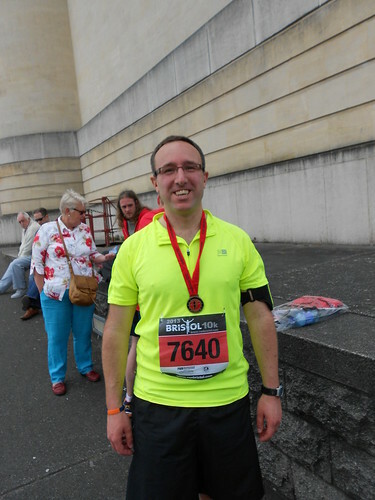 This entry was posted in Running and tagged Bristol, Bristol 10k, Life, Running by Simon Perks. Bookmark the permalink.